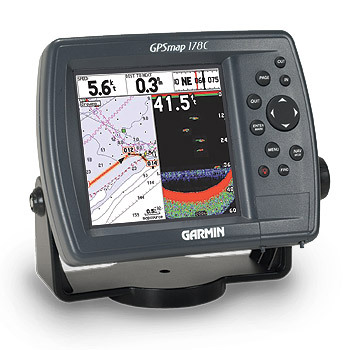 The GPSMAP® 178C Sounder is a new-generation fully integrated chartplotter and powerful sonar, offering the same brilliant sunlight-readable color LCD, powerful features, and simple interface as the GPSMAP 172C—all in a compact, value-priced console that leaves fish nowhere to hide. It comes standard with a built-in worldwide marine basemap and accepts MapSource® BlueChart® offshore marine cartography—featuring detailed depth contours, inter-tidal zones, wrecks, navaids, and many other points of interest. For fresh-water anglers, the GPSMAP 178C Sounder is compatible with MapSource Recreational Lakes with Fishing Hot Spots—featuring fishing areas, boat ramps, marinas, and hazards for hundreds of popular U.S. and Canadian lakes. Pre-programmed data cards can be easily inserted into the slot on the front of the unit. Other transducers are available. Email jollyannmarine@gmail.com with any inquiries.